From its beginnings in the Grasse region HÉVÉA has drawn nourishment from the aromatic heritage of this cradle of perfumery. Its founders, Christian Pamies, ethno-botanist perfume maker, and Valérie Sabini, specialist in natural cosmetics. From these two complementary personalities comes the wish for an alternative to traditional cosmetics. 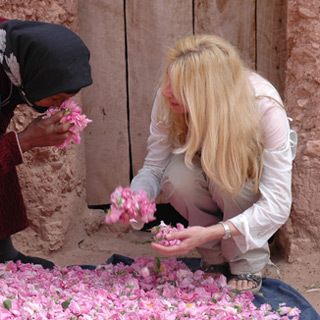 Wanting to work for fairer trade between north and south, their first project in this direction has taken the form of equitable trade partnerships with production at the very heart of the Vallée des roses in Morocco, making traditional practices and techniques accessible to modern tastes. Today the founders of HÉVÉA are giving greater depth and shape to their work. They travel the world studying relations between plants and man, absorbing on every occasion the subtleties of the vegetable world and its savoir-faire. In this gathering of historic savoir-faire the HÉVÉA range follows the path of its history and accomplishments. Christian PAMIES, ethno-botanist perfume maker, today places her signature on all HÉVÉA creations.